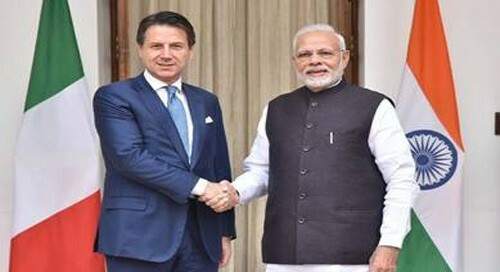 New Delhi, Oct 30 (IANS) India and Italy on Tuesday agreed to fast-track bilateral trade and investments and set up a bilateral industrial development and cooperation mechanism at a meeting between Prime Minister Narendra Modi and his Italian counterpart Guiseppe Conte here. "In order to give an impetus to enhanced economic cooperation between India and Italy, it was decided to set up a CEO Forum guided by a Joint Commission on Economic Cooperation (JCEC)," Modi tweeted following the meeting. "To increase two-way investments, we have decided to create a fast-track mechanism," he said. "To take this forward, the leaders tasked the JCEC to work towards constituting a CEO Forum and setting up a fast-track mechanism to promote two-way investments, and resolve issues, if any, confronted by the businesses in each other's country," the statement said. India is Italy's fifth largest trading partner in the European Union while Italy is the fifth largest investor in India. Conte, who assumed office in June, arrived here earlier on Monday to take part in the India-Italy Technology Summit organised by industry chamber CII in collaboration with India's Department of Science and Technology (DST) and the Italian government. Lauding Italy's rich tradition of scientific research and its reputation in manufacturing during the course of his valedictory address at the summit, Modi said the two sides can cooperate in devising technological solutions for industry. "We have also decided to set up various Indo-Italian Centres of Excellence. Business and industry of both countries are already cooperating in bringing cutting edge technology in various sectors and can cooperate fruitfully in areas like renewable energy, neurosciences and IT," he said. In his address, the Italian Premier said Italy's participation as partner country in this edition of DST's Technology Summit has a special symbolism coming on the 70th anniversary of diplomatic relations between Italy and India. "Innovation can be a catalyst for more inclusive growth and globalisation should not leave anyone behind," Conte said. "The common goal of our two governments is to be strategic partners in innovation," he said, adding the whole gamut of bilateral relations had been reviewed in his talks with Modi. "India invited Italian defence equipment manufacturing companies to invest in India under the Make in India initiative and to collaborate with Indian companies for design and construction of defence equipment," the statement said. This assumes significance given that India cancelled the contract with Italian firm Finmeccanica's British subsidiary AgustaWestland for supplying 12 AW-101 VVIP choppers to the Indian Air Force, over alleged breach of contractual obligations and on charges of paying kickbacks amounting to Rs 423 crore. "The leaders asserted that strong measures need to be taken against terrorists, terror organisations and all those who encourage, support and finance terrorism," the joint statement said. "They condemned all kinds of state support to terrorists including cross border terrorism and providing safe havens to terrorists and their network," it stated in what can be seen as a veiled reference to Pakistan.